SL Biotech Corporation is a sister company of SL Agritech Corporation that focuses on the research and development, manufacturing and marketing of effective, safe and environmental-friendly products for crop protection and plant nutrition. It was incorporated on December 10, 2008. The company carries its own line of insecticide, fungicide, bactericide, molluscicides and foliar fertilizer. Its initial clients are farmers enrolled under the contract growing program of SL Agritech Corporation and farmers using these super hybrid rice seeds — SL-8H, SL-12H and SL-18H varieties. 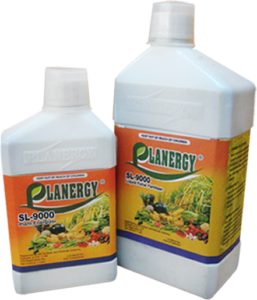 Planergy® SL-9000 Liquid Foliar Fertilizer is a compound fertilizer composed of humic acid, organic matters and other trace elements. The formulation of this product makes it widely applicable to many crops with no adverse effect to life and environment. The standards used for this was based on the physiological characteristics of crops and their nutritional requirement. BLB Stopper 20sc is a suspensible concentrate formulated from Thiodiazole Copper – a highly effective broad spectrum bactericide indicated for a wide variety of bacterial and fungal diseases in plants. Controlled experiments have shown that this product is effective against all types of rice bacterial leaf blight. Jolina 2.5 EC Insecticide is a chemical that fights major pests of rice, mango, tomato, onion, mung bean, corn, tobacco, cotton, cocoa and watermelon. These major pests include leaf hoppers, army worms, rice bugs, leaf folders and black bugs. 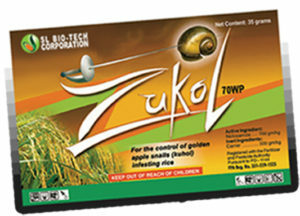 Zukol 70WP is an effective molluscicide in controlling Golden Apple Snail (Kuhol), thus protecting the rice crop at its early stage. It offers fast knockdown in transplanted and direct seeded rice at a very affordable cost. This product is green labeled hence, safe for the farmer. It only targets snails and not other organisms or animals present in the field such as frogs and ducks.